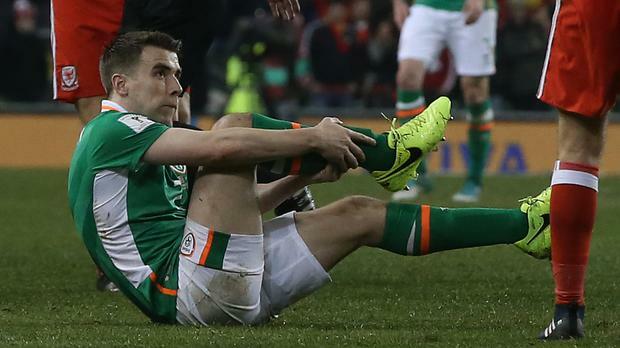 Seamus Coleman is expected to leave hospital on Wednesday as he starts the process of working his way back from a double leg fracture. Republic of Ireland boss Martin O'Neill revealed after his side's 1-0 friendly defeat by Iceland on Tuesday night that he had visited the 28-year-old full-back again - as has Irish president Michael D Higgins - and found him in much better spirits three days after undergoing surgery to pin his broken tibia and fibula. O'Neill said: "Seamus is doing much better today. I went to see him again. He's in better spirits. "It's as much to do with he's still got the family around - his brother, his wife, his mother and the youngster all keeping him pretty busy. I think he's doing much better now. It's not something you're going to get over in 24 hours, 36 hours. He's in much better spirits. "He's getting out tomorrow, I think. It's encouraging to see. He's very positive, which I knew he would be. It's a tough injury. Could he get over it? If anybody can quickly, then Seamus can do that." Coleman was one of a series of senior players unavailable to O'Neill, who took a look at the depth of his squad against Iceland. O'Neill handed full debuts to Brentford defender John Egan and Aston Villa midfielder Conor Hourihane and introduced Preston pair Andy Boyle and Daryl Horgan for the first time from the bench. Bristol City full-back Hordur Magnusson won the game for the visitors with a perfectly placed 21st-minute free-kick which proved to be one of few clear-cut chances on the night. But O'Neill left the Aviva Stadium, where his side had not lost since May 2014, having learned a little more about his fringe players, who discovered just what it will take to force their way into the Republic's long-term plans. The manager said: "Tonight would be great for some of the players to play, to know what it's like to step out and play at international level and try to do well in the length of time they're on the field of play. "Sometimes it is very difficult. There were a couple of lads making their debuts. John Egan, I thought, did fine. He got a cut head after a couple of minutes - we bandaged him up - and Hourihane played for the first time. "Some of those lads have that experience now. What will happen is that players now will obviously go back and resume club duties. "From my own viewpoint, I hope they stay clear of serious injury and maybe the time June comes around, we might have some of the other players back. "But who knows? It's in the lap of the gods." Iceland boss Heimir Hallgrimsson was delighted with a win in a game where he felt there was little to choose between the sides. He said: "I think we are quite equal teams playing a similar style of football, both tactically really well organised, defensively well organised, so it was a game of few chances. "We think there are similarities between these teams and I hope we have the same determination as the Irish because that's what we love about the Irish, the determination on the pitch." Colm Keys Connacht GAA hope to have what they claim is the biggest sports air dome of its kind in the world open by early December.